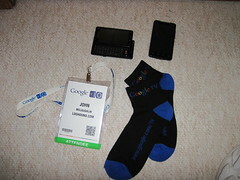 In case you didn't catch my various tweets (@loghound) you might have missed that I was at Google I/O last week. Similar to WWDC, I/O is a developers conference part education and part evangelism for developers to use their technologies. Also similiar to WWDC, I/O had a jam packed keynote (more on that later) -- This will likely be a long post as I feel the need to say a lot. First let me talk about WWDC '10. Sadly I'll not be attending WWDC this year -- I've gone for the last 3 in a row, the first year it blew my mind. Year two was satisfying but quite frankly last year was dissapointing. This is mostly because the material they covered was largely a repeat of the prior year and partly because of the iPhone focus. When I saw the agenda this year and realized it would be all iPhone and probably (most likely) a repeat of prior years I took a pass. Fortunatley I had signed up for Google I/O well in advance. I use a number of Google products and have considered going for a few years. While I was dissapointed to miss WWDC I was pretty excited going into I/O. It was fun to compare and contrast the two conferences. Held at the same Venue (Moscone West) at almost the same time of year (only about three weeks apart) for the (more or less) same crowd was interesting. In bullet points my observation(s) were. I/O is much more open -- Engineers actually go 'off script' and answer questions (and sometimes even (shock) share things they shouldn't). This is both good and bad as the Polish to most I/O presentations was quite a bit less than WWDC. Some of the material was poorly done or hard to follow and some sessions made poor use of time (one guy flew through his slides in 20 minutes and then didn't know what to say for the rest of the hour!). By comparison WWDC is always well polished -- Material is timed almost perfectly and the sessions last precisely the same amount of time. Winner: I/O -- While I wish a few of them had been a bit more polished I felt like I was getting information at a more 'engineer to engineer' level with less fear of going off script. Finally on Google vs. Apple -- Google poked a lot of fun at Apple (and I'm sure we'll see it poked back in a few weeks) -- It's been surprising to me to see how many people have come out of the wood work trying to defend apple or claim Google looked defensive. At the end of the day though what you have to do (and what I am still processing) is do I buy it? Honestly Google made a lot of very valid points. While I love my Apple products the fact is they are limited by what Apple/Jobs thinks they should do. Having played with my Android phones these last weeks I've been impressed with the kinds of integration and capabilities they have (although they are not nearly as pretty as an iPhone). I'm not sure where my head is at the end of the day -- I decided to try to use my Android exclusively for the next week or two to see how it works for me -- I'll report back later what I find. I'll admit it -- I've been (privately) pretty down on the app store process. After my first app was released (MovieFlick) I swore never again as the pain of trying to push out updates was too much. I eventually did a second app (DreamApp). The 1.3 version has been about two months getting out and I was ready to explode today when I got what I thought was another rejection but it all worked out fine. My first release of 1.3 had a real problem with new user accounts that I never tested and the Apple team found it so although it's frustrating to wait 3 weeks to find out they did a good job of finding a real problem. My second submit was rejected for using 'undocumented API's' -- you may have heard that Apple has a new static analysis tool for finding usage of non supported API's and my app was caught in that. It turns out that one of the libraries I use did have calls to unsupported API's but only for testing purposes (of the framework) - I never actually used them in my code. grumble, grumble ok submit again… Tonight I got *another* letter about unsupported API's and I was about to explode but then something odd happened…. I got an email saying 'Your app is now for sale'. It turns out the third letter pointed out the use of a non supported api (NSHost hostWithName) but instead of rejecting it they said "We'll let it go but please fix it for the next release" -- When I first read it I hadn't noticed that fine print but true to their word it's now available. So in this era of dog piling on top of Apple and the app store process I have to get them some credit for being pragmatic about this… They made a decision to release it but asked nicely for me to fix it next time. I went with Isaiah last year and it was overall a pretty good session -- Not anything mind blowing but a nice day with some good information. The format is one big classroom where they run through approximately 6-8 sessions. My guess is there will be sessions on Core animation, Open GL, Tools, Core Audio (less sure about that one), Core Data. Last year Apple bought us box lunches and we got a t-shirt (sadly the shirts were all the same size). Here is what I hope (pray) they announce. An overhaul of the iTunes rating system. The current one is horribly broken, as a developer it's horribly painful to see people complain of problems and have no way to get a hold of them to help fix it. I do everything I can to make my support email public but a surprising number of people will just complain in iTunes instead of trying to contact me -- Case in point: About 4 months ago Netflix had a server outage for a weekend…. It didn't effect all apps but it did effect mine so anyone using my app would find a problem. I actually worked with Netflix engineering over the weekend and by Sunday it was all back up but as you can guess I had a mass of 1 star ratings and 'this app doesn't work, wasted $1.99'. I was going crazy trying to sort out how to contact them to say "Hey, try it again, it's a server issue that now works" but it's impossible with the current system. I told everyone who would listen "I'm not going to get one". Way overpriced and my treo does everything I need it to do. I love collecting programming books but sadly on the mac most of them are either fairly obtuse, or try to hard to be funny (but really aren't) These two are the Crown Jems of beginning mac programming. which so far makes good reading. My favorite tip so far out of this book? , Makes some of the tedious parts of Mac OSX development in Objective C go away.. Wish I had know about this 6 months ago! We're in Monterey this weekend (well technically Pacific Grove) and it's kind of Rainy & Cold. I had a few moments to myself and decided to dig into Quartz Composer to see what all the fuss was about. It got me wondering... Is there any value in integrating something like this in some fashion with RW? A few obvious ideas are perhaps an easy way to generate animated graphics or buttons but I could also see Quartz Compositions as a way to do picture or text effects easily. In reality this kind of functionality needs to reside in the core RW product not a plugin so I doubt I'll ever do anything with it but it's so intriguing it really makes me think of all the possibilities.